I’ve been reading with great interest the news coming from Nepal (Life and Death Choices in a Himalayan Blizzard) of a freak snowstorm hitting the highest pass of the Annapurna Circuit — a 21-day trek that’s quite popular among backpackers traveling in the region. The storm caught many unawares, and dozens of people were caught up in it as they climbed to a height of more than 17,300 feet and made their way down the other side to the town of Muktinath. The tales are harrowing, of snow so deep it took minutes to make one step; nearly 30 people are dead or missing. I read with great interest, because I have done the Circuit, and trekked up that mountain side and cannot imagine doing it in the storm that’s been described. The trek — and walking over that pass — is one of the highlights of all of my travels. In 1998, I chucked my junior executive career out the window and set out on a year-long journey with my erstwhile spouse Melissa. After spending a few months in Southeast Asia, we flew to Kathmandu and hired a porter to carry our pack. The altitude and long days of trekking would make it hard for us to carry it by ourselves. Our porter was named Khagendra — an aspiring lawyer working for the trekking company to save up money for school — and one of the sweetest people I’ve met. 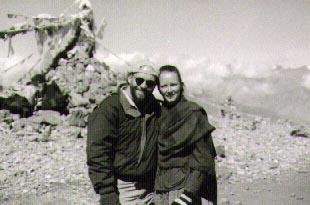 I wrote several posts during our trek, on our pre-blog-era website. This is the entry from the day we made the journey over the pass. At 5:00 a.m., when we got up and ready to get breakfast before hitting the trail, the sky was brilliant with stars. The clouds in the lower valley had cleared and the snows on the hills shined in the celestial light. Breakfast is sticky, but hot, and in the dining hall it’s chilly and you can see your breath, especially after drinking hot tea. Everyone seems excited about making the pass. One Israeli man, who had a headache from the altitude yesterday, seems fine this morning and is ready to make the journey. In the darkness, we gather our gear and head up the trail. As it winds in switchbacks up a green hill, which turns into rock and scree, we see a dog, which had been resting at the check-in post. He follows along with us as we light the trail with our flashlights, and trudge up the hill. Khagendra is watching our steps, worried as usual about our welfare. Aside from Khagendra, along with us are the Israeli couple and their porter, Susan from Canada and her guide Robi, and Phil from Britain, who speeds ahead of all of us only minutes into the hike. As we go higher and higher up this hill, we can see the first dawn light hitting the white peaks of Annapurna II. It’s pink and inviting, and there are no clouds at all in the sky. After about an hour, we make it past the first 500 meter or so rise in elevation, where it levels off for a while, and we pause to take a drink of water. As we wait for the others to come, the morning sun glows behind the hills and casts amazing shadows on the curtain-folds of the peaks to the south of us. We rest a while and the sun finally comes over the hills and warms up the morning. We move on up the trail, Melissa with her umbrella, protected from the heat, the dog following alongside us. Over one very narrow beam of a bridge and the path gets steep again. I concentrate on my breathing, and try to move my legs in such a way that with each pace I stretch out and rest one leg as I step with the other. The climb is exhilarating, but intense. As we rise, we pass the grave marker of a young British man who died here several years ago from Acute Mountain Sickness. He was walking with a French couple and he and the other man developed serious symptoms of altitude problems. The woman took her husband to a lower altitude and made the Brit promise he would stay in one spot until she came back. When she returned, he was gone, and she figured he had gone back to Phedi. What happened is that he was delirious from his brain swelling, and fell to his death in a snowy, rocky ravine. They found his body after the spring thaw. The rock cairn is a reminder to all who pass, that AMS is a very serious problem, and we are glad we are symptom-free and took the extra day to get to Thorong Phedi. A little further up the trail, and we pass a few false summits until we can see the little stone shack and cairn which mark Thorong La. Susan, the Canadian stock broker, is yodeling, singing the “lonely goat herd” song from “The Sound of Music.” All I can think of when she sings it is a terrible scene of pederasty in Arundati Roi’s book The God of Small Things, which takes place in the lobby during a showing of “The Sound of Music.” Susan yodels on up the trail. We hang a little behind in the rush for the pass, preferring the quiet of the mountain. About four hours after starting the hike, we reach the 5416 meter (17,331.2 feet or 3.28 mile-high) summit of the pass. Susan hands her camera to someone else and asks them to take pictures of her in zany poses. She leaps into the air and does cartwheels. Soon, we notice that Phil, the incredibly-fit 52 year-old Brit, has climbed even higher than the pass, up the surrounding rock faces, and is looking down at us from a few hundred feet above. He trots down when he sees that all of us have made it. At the rock cairn, topped with various Buddhist prayer flags, the group of us poses for photos. I place our camera on a mini-tripod I brought along and set the timer to be sure to get everybody in the shot. We have someone else take a shot of us with our buddy/porter Khagendra, and another of the two of us. It’s cold on the top here, and after about 25 minutes, we plan our descent down the other side. It will take us about six more hours to get to Muktinath, the next village at the base of the western side of the pass. After a half-hour of walking down, the guides and porters are wondering what’s taking us so long. They take off further ahead. Khagendra hangs with us for a while, and we feed the dog some of the bread we brought with us from Yak Kharka. The dog is still walking with us, pausing when we do to rest. Acclimatized, he doesn’t even pant on the trail, and since his knees bend the other way, he doesn’t have the problem on the descent that we do, with the constant downhill battering our joints. Eventually, we tell Khagendra (and the dog) to go on ahead and meet us at an abandoned shepherd’s lodge a ways down the trail. Susan’s guide, Robi, has gone ahead, and he’s carrying all of her water. When we finally reach the shepherd’s lodge, we find out that Robi drank all of Susan’s water. Another in the growing list of grievances Susan has with Robi. I guess he won’t be getting the big tip he’s already been lobbying for. A couple hours more and we rest at the abandoned shepherd’s lodge. From here, we can see the dry valley below, and we’re told that around the next mountain is Muktinath. Another hour and a half down the hill and we can see the green fields of farms in the valley, and soon we can make out the temples and the village of Muktinath. Six hours after reaching the top of the pass, about ten hours after starting off this morning, we arrive in Muktinath and look for a place to stay. We’re strangely attracted to a lodge called “The Bob Marley Hotel” and check into a room upstairs. Though this Marley is no Helmesley, it’s got beds with warm blankets, and we immediately crash after a long day of being on our feet. Our knees ache from that final descent. Our room is decorated with posters: one of Bon Jovi, all of the band in their black and blue jeans posing in front of a helicopter. There’s an 11 x 14 print of the Mona Lisa. And on each side of the bed, posters of kittens — one has an inspirational phrase, another is of the cats playing rock and roll instruments, including a left-handed bass guitarist (If you play their record backwards it says: “I buried Paul’s cat…”). Outside on the roof garden, with a few tables for dining, there are tomato plants and flowers growing. It’s all very typical of the other places we’ve stayed, with wooden ladders leading to the upper roof top and clotheslines stretched over gardens and tables. But it’s the dining room here that makes the “Bob Marley” special. Bob Marley’s face is everywhere in the dining room. The lyrics of “No Woman, No Cry” are written on the wall in large letters, and, in a country where ganja grows everywhere like the weed that it is, the rasta’s prized plant hangs in dry bundles from the ceiling. There’s also a stuffed rabbit below one of the Marley images. Kind of strange to see such decor, but we didn’t worry ’bout a thing, because “every little thing’s gonna be all right” seems to be a universal theme, and Marley’s music has followed us throughout Asia. As we eat dinner, we’re treated to the usual northern Nepal dinner fare, and the women in the kitchen don’t seem to pay much attention to the Marley decor and go about things in their Tibetan Buddhist way. We crash early, and turn the lights out on Jon, Mona and the guitar-playing kittens. Tomorrow, we’ll visit the famous temples here in Muktinath, head down the valley, past the ancient village of Jharkot, to Khagbeni, the furthest place north in the Mustang region that foreigners are allowed to go without a permit. The Berlin Wall fell 25 years ago. Photographer Anthony Suau was there.